Sian has recently joined an archaeological dig in Whitby. Troubled by horrifying nightmares after an accident in Bosnia that left her badly injured, she is trying to get by one day at a time, while trying to forget about the pain in her leg that she believes could be cancer. When she meets Mack and his gorgeous dog, Hadrian, she feels a flash of life return to her again; even more so when Mack presents her with a centuries old murder mystery that she feels compelled to solve. She also hopes that the fact that she can do something so satisfying will bring her closer to Mack. Will she be successful? Will she forge a new relationship with Mack – or are her deep-rooted issues too great to overcome? Set in Whitby around the Abbey, there is a very Gothic theme to the book, backed up by the numerous references to Dracula. This is perfect for a murder mystery, because it sets the scene perfectly. It must be stressed, however, that the mystery isn’t really the focus of the story overall. It is very much about Sian and her rite of passage from utter despair through to a glimmer of hope; the mystery is just there as a device to get her from one extreme to the other. That didn’t concern me in the slightest. I loved both Sian’s story and the mystery part – I think they worked very well together to present a fulfilling and intriguing story. Considering the author is actually Dutch and grew up in Australia (although he now lives in the Scottish Highlands), I think he did a fabulous job of capturing the Northern feel of Whitby. I thought Sian was a very well drawn character. She isn’t immediately likable – she is very prickly and clearly finds it hard to socialize. However, the reason for this, merely gently hinted at to begin with, soon becomes clear and she really grew in my estimation. Faber turns her into a very sympathetic character, with whom I could really identify. For anyone who doesn’t like the touchy feely aspect of Sian’s story, however, there is no need to be concerned. It is kept brief and at least partially covered up by the mystery angle. Sian really is the only character with any development – the story is told from her point of view. However, enough is told of Mack to be intriguing – and I really wanted them to get together, although this is far from being a love story. The relationship that builds up between Hadrian (the dog) and Sian is really touching and very well done. The way that the book is written is excellent. The author uses very precise language that is deliberately concise, yet manages to convey a great deal. The reader is able to get a real feel for the main settings of Whitby that the story takes place in and the site of the dig with its hundred and ninety-nine steps is particularly vivid. This is a novella, so is very short, at just over 100 pages and there are no chapters as such. This isn’t a great problem, because there are longer than usual paragraph breaks to show where the reader can leave the story for a while. Nevertheless, I would have preferred some more obvious breaks. The only major criticism that I have has nothing to do with the author, but rather the publisher. The print on each page is very narrow, presumably to make the book look longer than it really is. I found this a waste of paper, especially in this day and age of being environmentally-friendly, and would much rather have had a shorter book with fuller pages. The aim is perhaps to age the book in the style of the eighteenth century (which is when Sian’s ‘mystery’ took place), but it really didn’t impress me very much. As an ‘extra’, there is another Michel Faber story that comes with the book and is called The Courage Consort. However, this review is on The Hundred and Ninety-Nine Steps only. 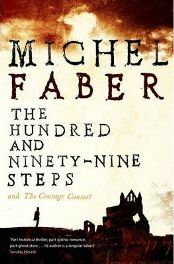 The Hundred and Ninety-Nine Steps was excellent and would certainly like to read more in that ilk. I’m a fan of mysteries anyway, but the added bonus of the interesting character and the Gothic setting make it that much more enjoyable. I’ll certainly look out for more books by this author and hope that they are of this quality, because it doesn’t get much better than this. Five stars out of five, highly recommended. Published by Canongate books (April 2010), it has 288 pages. Thanks to Canongate for providing a free review copy of the book. No Comments on "Gothic Whitby"
My background is varied. I studied Chinese at Durham University in the UK, Renmin University in Beijing and Nanjing University. I then lived in China for many years, before returning to the UK to study criminology at the London School of Economics, from where I have a Masters. I have published articles on drug treatment and the criminal justice system. Although I have now left this field, I do enjoy crime fiction and reviewing books from this genre. I also have a strong interest in Chinese modern fiction.